In our latest Microsoft Flow roundup we look at codeless approaches to converting Excel to JSON outputs, multi-selecting inputs, a complex flow for Dynamics 365 Project Service Automation, and more. Want to see your flow featured in a future edition of this series? Contact me with your example. 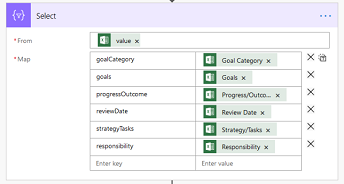 Scott Hanselmanshared a process on his blog to export JSON data from an Excel file. However, Natraj Yegnaraman, writing in Dreaming in CRM, drew inspiration from the first process but opted for a codeless alternative using Flow. The new approach, which he set up in 15 minutes, uses an HTTP GET trigger to read from an Excel file stored in OneDrive. Yegnaraman stated that the JSON output comes out poorly formatted with a large number of spaces and special characters that map to the column names of the table. "So, we can simply re-shape the data using Select, and dump the JSON response," he wrote. "With Flow add-on for Excel, you could run the same Flow from Excel itself, if you want to," Yegnaraman added. The difference being is that if you try to consume the output of the Flow multi-select selections, Flow treats them as multiple different responses. And as such when the next action to use them follows it will automatically create an apply to each loop, creating one new record for each of the items selected as follows. According to Weinstock, to set options as the inputs for a single field in the Common Data Service (CDS), users need to initialize a variable and concatenate responses. Flow has simple two or three line command boxes to initialize and concatenate to create a single string value. Drawing inspiration from a question on the Dynamics Community forum about updating expense estimates in Dynamics 365 Project Service Automation (PSA), Antti Pajunenshared a Flow-based approach on his Day to Day Dynamics 365 blog.